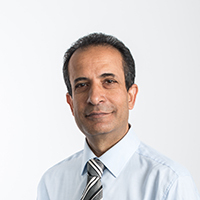 Professor Sayma obtained BSc in Mechanical Engineering with Distinction from Birzeit University in Palestine in 1987, MSc in Energy Technology from Salford University in 1990 and PhD from UMIST in 1994. His thesis topic was Finite Element model for dense gas dispersion in the atmosphere. He joined the Aeronautics department at Imperial College London in 1994 on EPSRC funded project as a research assistant where he worked on the development of an external aerodynamic compressible flow model introducing boundary layer grids and viscous effects in the Euler solver. In 1996, he joined the Rolls Royce Vibration University Technology Centre (VUTC) at the Department of Mechanical Engineering, Imperial College London, where he stayed for about 9 years. He progressed to a Research Fellow, Senior Research Fellow and then Principal Research Fellow. In 2001, he was awarded the title RolIs Royce reaserch fellow at Imperial College and in 2003 he was awarded a Royal Academy of Engineering Senior Research Fellow co-funded by Rolls-Royce Plc. During his spell at the VUTC, he was one of two main developers for the unsteady aerodynamics and aeroelatisity code AU3D which has been the main aeroelasticity system at Rolls Royce. He also contributed to several major aero-engine projects including analysis of compressors, fans, turbines, rotating cavities, intake and bypass ducts and downstream nozzles. In 2005 he became a Senior Lecturer in Computational Mechanics at Brunel University. A year later, he was given a Chair in Computational Fluid Dynamics at the University of Sussex where he worked at the Thermo-Fluid Mechanics Research Centre (TFMRC) at the Department of Engineering and Design. He continued to lead research in unsteady compressible flow in turbomacinery, where he focused on industrial gas turbines and micro-gas turbines. He held several senior administrative positions, the last of which was the Director of Research and Knowledge Exchange for the School of Engineering and Informatics. He also introduced a new MSc in Sustainable Energy Technology. In January 2013, he joined City University London as a Professor of Energy Engineering. He is currently leading EU FP7 consortium for conducting research and demonstration of a concentrated solar power system powering a small-scale micro-gas turbine. He is also conducting research in waste heat recovery using small scale Organic Rankine Cycle (ORC) in addition to continued activity in turbomachinery CFD and aeroelasticity.He has been an active member of the European Turbine Network (ETN), based in Brussels, which coordinates European industrial gas turbine activities across the whole value chain. He has been the chairman of the Cycle Efficiency Technical Committee and he is currently a member of the ETN project board. 2. Concentrated Solar Power Micro Gas Turbine with Thermal Energy Storage (SolGATS) (April 2017-March 2019): Project co-funded InnovateUK and Ministry of Science and Technology of China (MoST) under Newton Bridges Scheme. The project aims at integrating solar powered microbes turbine systems with high temperature long term energy storage. 3. Fundamental Studies of Organic Rankine Cycle Expanders (NextORC) (May 2017 - April 2020). This project funded by EPSRC aims at investigating, experimentally and computationally, the fundamental aspects and performance of turbo and screw expanders for small scale ORCs. The aim of this research is to improve the understanding of ORC expander design and off-design performance through developing, and validating, suitable tools to accurately predict design point scaling and off-design performance of ORC systems. Most notably, this refers to predicting the design and off-design performance of supersonic turbines and two-phase screw expanders. These tools will be validated through suitable experimental tests, and will then be used in steady state, dynamic and techno-economic simulations of different cycle configurations. The project aims at the development of a concentrated solar power (CSP) parabolic dish system generating electricity using a micro gas turbine (MGT) with thermal energy storage using solid particles, which can be used in combined power, heating and cooling. The aim is to advance current MGT-CSP technology developed by City University and integrate it with a solar dish technology and high temperature thermal storage using solid particles developed by Zhejiang University to provide an optimised system that can produce energy from solar power reliably while minimising the need for back up power thus maximising environmental benefit. The system is an alternative to CSP-Sterling technology that suffers from poor reliability and difficulty to integrate with thermal storage. The innovation arises from system and component level developments allowing the efficient and reliable integration. The technology can be deployed in standalone mode or stacked in a flexible manner for medium power plants. The advantages over Photovoltaic arise from the integrated energy storage, reduced land use, tri-generation and higher efficiency particularly in hot climates with direct sunlight. Sayma, A. Computational Fluid Dynamics. Bookboon. ISBN 978-87-7681-430-4. Long, C. and Sayma, N. Heat Transfer. Bookboon. ISBN 978-87-7681-432-8. Long, C. and Sayma, N. Heat Transfer: Exercises. Bookboon. ISBN 978-87-7681-433-5. Iaria, D., Alzaili, J. and Sayma, A.I. (2018). Solar dish micro gas turbine technology for distributed power generation. Green Energy and Technology (pp. 119–131). Sayma, A., Vahdati, M., Wu, X. and Imregun, M. (2003). Recent developments in unsteady flow modelling for turbomachinery aeroelasticity. In Elder, R.L., Towlidakis, A. and Yates, M.K. (Eds. ), Advnaces of CFD in Fluid Machinery Design IMechE. Vahdati, M., Sayma, A. and Imregun, M. (1999). Case studies in Turbomachinery Aeroelasticity using an integrated 3D non-linear method. In Sieverding, C.H. and Fransson, T.H. (Eds. ), Aeroelasticity in axial-flow turbomachines, Lecture Series Karman Institute for Fluid Dynamics. Sayma, A., Vahdati, M., Green, J.S. and Imregun, M. (1998). Whole-assembly flutter analysis of a low pressure turbine blade. In Fransson ed, T.H. (Ed. ), Unsteady Aerodynamics and Aeroelasticity of Turbomachines (pp. 347–359). Kluwer Academic Publishers, Dordrecht. Sbardella, L., Sayma, A. and Imregun, M. (1998). Semi-unstructured mesh generator for flow calculations in axial turbomachinery blading. In Fransson, T.H. (Ed. ), Unsteady Aerodynamics and Aeroelasticity of Turbomachines (pp. 541–554). Kluwer Academic Publishers, Dordrecht. Piero, J. and Sayma, A. (1996). A 3-D unstructured multigrid Navier-Stokes solver. In Morton, K.W. and Baines, M.J. (Eds. ), Numerical Methods for Fluids Dynamics Oxford University Press. Sayma, A.I. Gas Turbines for Marine Applications. (pp. 1–10). John Wiley & Sons, Ltd. ISBN 978-1-118-47635-2. White, M., Read, M. and Sayma, A. (2018). Using a cubic equation of state to identify optimal working fluids for an ORC operating with two-phase expansion using a twin-screw expander. 17th International Refrigeration and Air Conditioning Conference 9-12 July, Purdue, USA. White, M., Read, M. and Sayma, A. (2018). Optimisation of cascaded organic Rankine cycle systems for high-temperature waste-heat recovery. ECOS 2018 - The 31st International Conference on Efficiency, Cost, Optimization, Simulation and Environmental Impact of Energy Systems 17-22 June, Guimarães. White, M. and Sayma, A. (2018). A preliminary comparison of different turbine architectures for a 100 kW supercritical CO2 Rankine cycle turbine. The 6th International Supercritical CO2 Power Cycles Symposium 27-29 March, Pittsburgh, Pennsylvania. White, M.T. and Sayma, A.I. (2018). Design of a Closed-Loop Optical-Access Supersonic Test Facility for Organic Vapours. ASME Turbo Expo 2018: Turbomachinery Technical Conference and Exposition. White, M.T. and Sayma, A.I. (2018). Design of a closed-loop optical-access supersonic test facility for organic vapours. Ghavami, M., Alzaili, J. and Sayma, A.I. (2017). A comparative study of the control strategies for pure concentrated solar power micro gas turbines. Arroyo, A., McLorn, M., Fabian, M., White, M. and Sayma, A.I. (2016). Rotor-dynamics of different shaft configurations for a 6 KW micro gas turbine for concentrated solar power. White, M. and Sayma, A.I. (2016). Investigating the effect of changing the working fluid on the three-dimensional flow within organic rankine cycle turbines. Li, Y.L. and Sayma, A. (2014). Numerical investigation of VSVs mal-schedule effects in a threestage axial compressor. Nucara, P. and Sayma, A. (2012). Effects of using Hydrogen-rich syngas in industrial gas turbines while maintaining fuel flexibility on a multistage axial compressor design. Li, Y. and Sayma, A. (2012). Effects of blade damage on the performance of a transonic axial compressor rotor. Moghaddam, E.R., Coren, D., Long, C. and Sayma, A. (2011). A numerical investigation of moment coefficient and flow structure in a rotor-stator cavity with rotor mounted bolts. Wang, F., Sayma, A.I., Peng, Z.J. and Huang, Y. (2011). A multi-section droplet combustion model for spray combustion simulation. Nucara, P. and Sayma, A. (2011). Effects of using Hydrogen-rich Syngas in industrial gas turbines while maintaining fuel flexibility on compressor design. Wang, F., Dong, W. and Ji, Y. (2010). Logic deduction agent based distributed parallel test platform on hardware-in-the-loop simulation system. the 2010 Spring Simulation Multiconference 11-15 April. Bohari, B. and Sayma, A. (2010). CFD analysis of effects of damage due to bird strike on fan performance. Wang, F., Leboeuf, F., Huang, Y., Zhou, L.X. and Sayma, A.I. (2010). An algebraic sub-grid scale turbulent combustion model. Swalen, M.J.P., Koenig, C.S., Sayma, A.I. and Khir, A.W. (2010). CFD MODELLING OF A BI-DIRECTIONAL AXIAL FLOW LVAD. Patel, K.N., Koenig, C.S., Sayma, A.I. and Khir, A.W. (2009). TRANSIENT BEHAVIOR OF DIFFERENT IMPELLER DESIGN OF A PULSATILE AXIAL FLOW LVAD: A COMPUTATIONAL STUDY. Swalen, M.J.P., Koenig, C.S., Sayma, A.I. and Khir, A.W. (2009). COMPUTATIONAL STUDY OF A NOVEL AXIAL FLOW PUMP AS LVAD. Swalen, M.J.P., Koenig, C.S., Sayma, A.I. and Khir, A.W. (2008). DEVELOPMENT OF A NOVEL VENTRICULAR ASSIST DEVICE (VAD). Sayma, A.I. (2007). Steady-flow analysis of low pressure compression system for turbofan engines. Sladojević, I., Sayma, A.I. and Imregun, M. (2007). Influence of stagger angle variation on aerodynamic damping and frequency shifts. Sayma, A.I., Vahdti, M., Imregun, M. and Marshal, J. (2007). Low-pressure compression system effects on fan assembly forced response. Saiz, G., Imregun, M. and Sayma, A.I. (2006). A multi blade-row linearised analysis method for flutter and forced response predictions in turbomachinery. Sladojević, I., Petrov, E.P., Imregun, M. and Sayma, A.I. (2006). Forced response variation of aerodynamically and structurally mistuned turbo-machinery rotors. Wilson, M.J., Imregun, M. and Sayma, A.I. (2006). The effect of stagger variability in gas turbine fan assemblies. Di Mare, L., Simpson, G. and Sayma, A.I. (2006). Fan forced response due to ground vortex ingestion. Di Mare, L., Simpson, G., Mueck, B. and Sayma, A.I. (2006). Effect of bleed flows on flutter and forced response of core compressors. Di Mare, L., Sayma, A.I., Coupland, J. and Imregun, M. (2005). Acoustic liner models in a general purpose CFD code. Wilson, M.J., Imregun, M. and Sayma, A.I. (2005). The effect of stagger variability in gas turbine fan assemblies. Sladojević, J., Petrov, E.P., Sayma, A.I., Imregun, M. and Green, J.S. (2005). Investigation of the influence of aerodynamic coupling on response levels of mistuned bladed DISCS with weak structural coupling. Wu, X., Sayma, A.I., Vahdati, W. and Imregun, M. (2004). Computational techniques for aeroelasticity and aero-acoustic analyses of aero-engine fan assemblies. Cand, M., Sayma, A.I. and Imregun, M. (2004). 3-Dimensional noise propagation using a Cartesian grid. Wu, X., Vahdati, M., Sayma, A.I. and Imregun, M. (2003). A numerical investigation of aeroacoustic fan blade flutter. Bréard, C., Sayma, A., Imregun, M., Wilson, A.G. and Tester, B.J. (2001). A CFD-based non-linear model for the prediction of tone noise in lined ducts. Bréard, C., Vahdati, M., Sayma, A.I. and Imregun, M. (2000). An integrated time-domain aeroelasticlty model for the prediction of fan forced response due to inlet distortion. Bréard, C., Imregun, M., Sayma, A. and Vahdati, M. (1999). Flutter stability analysis of a complete fan assembly. Vahdati, M., Sayma, A. and Imregun, M. (1998). Prediction of high and low engine order forced responses for an LP turbine blade. Sayma, A.I., Vahdati, M. and Imregun, M. (1998). Forced response analysis of an intermediate pressure turbine using a nonlinear aeroelasticity model. Betts, P.L. and Sayma, A.I. (1992). On the suppression of pressure checkerboarding with bilinear-constant mixed interpolation. Khader, M.A. and Sayma, A.I. (2018). Drag reduction within radial turbine rotor passages using riblets. Proceedings of the Institution of Mechanical Engineers, Part E: Journal of Process Mechanical Engineering pp. 95440891881939–95440891881939. doi:10.1177/0954408918819399 . Iaria, D., Nipkey, H., Zaili, J.A., Sayma, A.I. and Assadi, M. (2018). Development and validation of a thermo-economic model for design optimisation and off-design performance evaluation of a pure solar microturbine. Energies, 11(11). doi:10.3390/en11113199 . White, M.T., Markides, C.N. and Sayma, A.I. (2018). Working-fluid replacement in supersonic organic Rankine Cycle Turbines. Journal of Engineering for Gas Turbines and Power, 140(9). doi:10.1115/1.4038754 . White, M.T. and Sayma, A.I. (2018). A generalised assessment of working fluids and radial turbines for non-recuperated subcritical organic rankine cycles. Energies, 11(4). doi:10.3390/en11040800 . Li, Y. and Sayma, A.I. (2018). Computational Fluid Dynamics Simulation of Surge in a Three Stage Axial Compressor. International Journal of Turbines & Sustainable Energy Systems, 1(1). doi:10.4273/ijtse.1.1.04 . Khader, M.A., Sayma, A.I. and IOP, (2017). Effect of end-wall riblets on radial turbine performance. IOP Conference Series: Materials Science and Engineering, 232. doi:10.1088/1757-899X/232/1/012075 . Ioannou, E. and Sayma, A.I. (2017). Full annulus numerical study of hot streaks propagation in a hydrogen-rich syngas-fired heavy duty axial turbine. Proceedings of the Institution of Mechanical Engineers, Part A: Journal of Power and Energy, 231(5), pp. 344–356. doi:10.1177/0957650917706861 . White, M., Sayma, A.I. and Markides, C.N. (2017). Supersonic flow of non-ideal fluids in nozzles: An application of similitude theory and lessons for ORC turbine design and flexible use considering system performance. Journal of Physics: Conference Series, 821(1). doi:10.1088/1742-6596/821/1/012002 . White, M. and Sayma, A.I. (2016). Improving the economy-of-scale of small organic rankine cycle systems through appropriate working fluid selection. Applied Energy, 183, pp. 1227–1239. doi:10.1016/j.apenergy.2016.09.055 . White, M. and Sayma, A.I. (2015). The Application of Similitude Theory for the Performance Prediction of Radial Turbines Within Small-Scale Low-Temperature Organic Rankine Cycles. Journal of Engineering for Gas Turbines and Power, 137(12). doi:10.1115/1.4030836 . Li, Y.L. and Sayma, A.I. (2015). Computational fluid dynamics simulations of blade damage effect on the performance of a transonic axial compressor near stall. Proceedings of the Institution of Mechanical Engineers, Part C: Journal of Mechanical Engineering Science, 229(12), pp. 2242–2260. doi:10.1177/0954406214553828 . White, M. and Sayma, A.I. (2015). The impact of component performance on the overall cycle performance of small-scale low temperature organic Rankine cycles. IOP Conference Series: Materials Science and Engineering, 90(1). doi:10.1088/1757-899X/90/1/012063 . White, M. and Sayma, A.I. (2015). System and component modelling and optimisation for an efficient 10 kWe low-temperature organic Rankine cycle utilising a radial inflow expander. Proceedings of the Institution of Mechanical Engineers, Part A: Journal of Power and Energy, 229(7), pp. 795–809. doi:10.1177/0957650915574211 . White, M. and Sayma, A.I. (2015). The one-dimensional meanline design of radial turbines for small scale low temperature organic rankine cycles. Proceedings of the ASME Turbo Expo, 2C. doi:10.1115/GT2015-42466 . SAYMA, A., Moghadam, E.R. and Long, C.A. (2013). Numerical investigation of moment coefficient and flow structure in a rotor stator cavity with rotor mounted bolts. Proceedings of the Institution of Mechanical Engineers Part A: Journal of Power and Energy, 227(3). SAYMA, A. (2011). Towards virtual testing of compression systems in gas turbine engines. NAFEMS International Journal of CFD Case Studies. di Mare, L., Imregun, M., Green, J.S. and Sayma, A.I. (2010). A numerical study of labyrinth seal flutter. Journal of Tribology, 132(2), pp. 1–7. doi:10.1115/1.3204774 . Cooke, A., Childs, P., Sayma, N. and Long, C.A. (2009). A disc to air heat flux error and uncertainty analysis applied to a turbomachinery test rig design. Proceedings of the Institution of Mechanical Engineers, Part C: Journal of Mechanical Engineering Science, 223(3), pp. 659–674. doi:10.1243/09544062jmes1158 . Chassaing, J.C., Sayma, A.I. and Imregun, M. (2008). A combined time and frequency domain approach for acoustic resonance prediction. Journal of Sound and Vibration, 311(3-5), pp. 1100–1113. doi:10.1016/j.jsv.2007.10.006 . Bartels, R.E. and Sayma, A.I. (2007). Computational aeroelastic modelling of airframes and turbomachinery: progress and challenges. Philos Trans A Math Phys Eng Sci, 365(1859), pp. 2469–2499. doi:10.1098/rsta.2007.2018 . Wilson, M.J., Imregun, M. and Sayma, A.I. (2007). The effect of stagger variability in gas turbine fan assemblies. Journal of Turbomachinery, 129(2), pp. 404–411. doi:10.1115/1.2437776 . Vahdati, M., Sayma, A.I., Imregun, M. and Simpson, G. (2007). Multibladerow forced response modeling in axial-flow core compressors. Journal of Turbomachinery, 129(2), pp. 412–422. doi:10.1115/1.2436892 . Vahdati, M., Sayma, A.I., Freeman, C. and Imregun, M. (2005). On the use of atmospheric boundary conditions for axial-flow compressor stall simulations. Journal of Turbomachinery, 127(2), pp. 349–351. doi:10.1115/1.1861912 . Wu, X., Vahdati, M., Sayma, A. and Imregun, M. (2005). Whole-annulus aeroelasticity analysis of a 17-bladerow WRF compressor using an unstructured Navier-Stokes solver. International Journal of Computational Fluid Dynamics, 19(3), pp. 211–223. doi:10.1080/10618560410001715554 . Sayma, A.I., Vahdati, M., Lee, S.J. and Imregun, M. (2003). Forced response analysis of a shaft-driven lift fan. Proceedings of the Institution of Mechanical Engineers, Part C: Journal of Mechanical Engineering Science, 217(10), pp. 1125–1138. doi:10.1243/095440603322517144 . Sayma, A.I., Kim, M. and Smith, N.H.S. (2003). Leading-edge shape and aeroengine fan blade performance. Journal of Propulsion and Power, 19(3), pp. 516–519. Sayma, A.I., Bréard, C., Vahdati, M. and Imregun, M. (2002). Aeroelasticity analysis of air-riding seals for aero-engine applications. Journal of Tribology, 124(3), pp. 607–616. doi:10.1115/1.1467086 . Bréard, C., Sayma, A.I., Vahdati, M. and Imregun, M. (2002). Aeroelasticity analysis of an industrial gas turbine combustor using a simplified combustion model. Journal of Fluids and Structures, 16(8), pp. 1111–1126. doi:10.1006/jfls.2002.0466 . Vahdati, M., Sayma, A.I., Bréard, C. and Imregun, M. (2002). Computational study of intake duct effects on fan flutter stability. AIAA Journal, 40(3), pp. 408–418. doi:10.2514/2.1680 . Bréard, C., Vahdati, M., Sayma, A.I. and Imregun, M. (2002). An integrated time-domain aeroelasticity model for the prediction of fan forced response due to inlet distortion. Journal of Engineering for Gas Turbines and Power, 124(1), pp. 196–208. doi:10.1115/1.1416151 . Barakos, G., Vahdati, M., Sayma, A.I., Bréard, C. and Imregun, M. (2001). A fully distributed unstructured Navier-Stokes solver for large-scale aeroelasticity computations. Aeronautical Journal, 105(1041-1050), pp. 419–426. Vahdati, M., Sayma, A.I., Marshall, J.G. and Imregun, M. (2001). Mechanisms and prediction methods for fan blade stall flutter. Journal of Propulsion and Power, 17(5), pp. 1100–1108. doi:10.2514/2.5850 . Sayma, A.I., Vahdati, M. and Imregun, M. (2000). Multi-bladerow fan forced response predictions using an integrated three-dimensional time-domain aeroelasticity model. Proceedings of the Institution of Mechanical Engineers, Part C: Journal of Mechanical Engineering Science, 214(12), pp. 1467–1483. doi:10.1243/0954406001523425 . Sbardella, L., Sayma, A.I. and Imregun, M. (2000). Semi-structured meshes for axial turbomachinery blades. International Journal for Numerical Methods in Fluids, 32(5), pp. 569–584. doi:10.1002/(SICI)1097-0363(20000315)32:53.0.CO;2-V .
Sayma, A.I., Vahdati, M. and Imregun, M. (2000). Turbine forced response prediction using an integrated non-linear analysis. Proceedings of the Institution of Mechanical Engineers, Part K: Journal of Multi-body Dynamics, 214(1), pp. 45–60. doi:10.1243/1464419001544133 . Sayma, A.I., Vahdati, M., Sbardella, L. and Imregun, M. (2000). Modeling of three-dimensional viscous compressible turbomachinery flows using unstructured hybrid grids. AIAA journal, 38(6), pp. 945–954. doi:10.2514/2.1062 . Sayma, A.I., Vahdati, M. and Imregun, M. (2000). An Integrated Nonlinear Approach for Turbomachinery Forced Response Prediction. Part I: Formulation. Journal of Fluids and Structures, 14(1), pp. 87–101. doi:10.1006/jfls.1999.0253 . Vahdati, M., Sayma, A.I. and Imregun, M. (2000). An Integrated Nonlinear Approach for Turbomachinery Forced Response Prediction. Part II: Case Studies. Journal of Fluids and Structures, 14(1), pp. 103–125. doi:10.1006/jfls.1999.0254 . Sayma, A.I., Vahdati, M., Imregun, M. and Green, J.S. (1998). Whole-assembly flutter analysis of a low-pressure turbine blade. Aeronautical Journal, 102(1018), pp. 459–463. Sayma, A.I. and Betts, P.L. (1998). Numerical modelling of thermal radiation absorption during the dispersion of dense gas clouds in the atmosphere. International Journal for Numerical Methods in Fluids, 26(7), pp. 837–850. Sayma, A.I. and Betts, P.L. (1997). A finite element model for the simulation of dense gas dispersion in the atmosphere. International Journal for Numerical Methods in Fluids, 24(3), pp. 291–317. doi:10.1002/(SICI)1097-0363(19970215)24:33.0.CO;2-# .